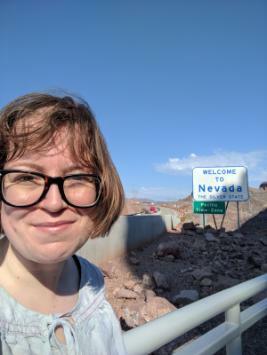 In August this year, I flew to Las Vegas for one of the largest U.S. theatre conferences, held by ATHE (Association for Theatre in Higher Education) in the perhaps unlikely location of the Planet Hollywood Casino. The conference, around the theme of 'Spectacle: Balancing Education, Theory and Practice' brought together several hundred academics from American colleges and universities, along with international scholars and theatre practitioners. The conference focused on the question of whether the kinds of performance that happen in Vegas stay in Vegas, or if Vegas has an impact on global theatre performances. While Vegas seems like a ridiculously glamorous spot to go for a work trip, (and it really was), the conference was an extraordinary opportunity to hear about new research and thinking about the musical, and for broader discussions about how that research is reshaping teaching. Presenting our research isn’t anything new: staff and students in the Department of Music regularly present our work at international and national conferences, which is testament to the department’s focus on cutting edge practice and research led teaching. Within my particular area - musical theatre - four papers were presented at one conference - at ‘Song, Stage and Screen’ this June at Guildford School of Acting, by myself, James Lovelock, and two of our post-graduate students. But this time, I was on my own, to chair a panel on reframing the musical with four other specialists in musical theatre from the U.S. and Canada. Vegas, as well as the partying and neon lights, is also a major centre for performance in America, with a tradition of performers’ residences at the Casinos, numerous long-running spectaculars by groups such as Cirque du Soleil, and a history of hosting Broadway musicals such as Jersey Boys. While I was there, I was lucky enough to see the extraordinary production, The Beatles LOVE, (a good way to make the whole department of music jealous), which brings together a reimagined soundscape of the Beatles’ music and clips from them in the recording studio with the sense of jaw-dropping theatricality Cirque have become so well known for. But what made the trip even more exciting for me was that the panel featured several chapters from a forthcoming book that I am editing called Reframing the Musical: Race, Culture and Identity (Palgrave Macmillan, 2018), and it would be the first time I’d meet several of the contributors in person. I’ve been lucky enough to do research in New York, but this would also be my first time on the West Coast, and my first time in the ridiculous neon spectacle of Las Vegas, a city in the middle of the desert. The panel was hosted by the Music Theatre and Dance working group and the Black Theatre Association, and featured the work of Donatella Galella, Dwayne Keith Mann, Kathryn Edney, Sean Mayes, Eric Glover and myself. In sharing our work, I was struck by how the University of Wolverhampton BA (hons) Musical Theatre and MA Musical Theatre courses are responding to what is being called New Musical Theatre Studies: in addressing ‘hidden histories’ of the musical, the contribution of black cultural practices, and the contributions of those whose identities are often sidelined in the making of musicals. What we do here at the University of Wolverhampton is part of the global conversation about musical theatre.